Thanks to strict regulatory requirements, the network quality of all ­Singapore operators is very high. This makes it very intersting to compare their performance with that of other leading world capitals. Also, we have taken a detailed look into the performance of each Singapore operator. The Singapore market is known for its high network quality. Thus, it is not surprising that the three operators considered in this review rank closely. And still, our holistic network ­testing approach, comprised of a data-centric drivetest and sophisticated crowdsourcing ­analyses, reveals specific strengths of each operator. As this Mobile Review for the networks in Singapore does not use the full ­methodology of our regular Network Benchmarks, we abstained from ranking or ­grading the operators. However, the ­results of our data-centric ­drivetest and crowdsourcing analysis ­provides a good indica­tion of their achieve­ments. The drivetest result shows the maximum performance of the networks, where­as the crowd evaluation reflects the actual user experience. The drivetest results confirm that all three Singapore opera­tors ­deliver a high level of data per­formance and rank closely. How­ever, in our drivetest, Singtel shows a slight advantage over its competitors. In the detailed ­analysis, each ­operator demonstrates specific strenghts: M1 is ahead in the web browsing tests and also takes a narrow lead in the file uploads. Singtel provides the ­fastest file downloads, while StarHub scores best in the ­YouTube measurements. The extensive crowdsourcing analysis, based on 344 ­million samples collected in two consecutive 3-month-periods from April to June and July to September 2018, overall validates ­these findings. The results show the high performance level of all three networks. The quality of 4G ­coverage was a little lower in the first ­evaluation period. 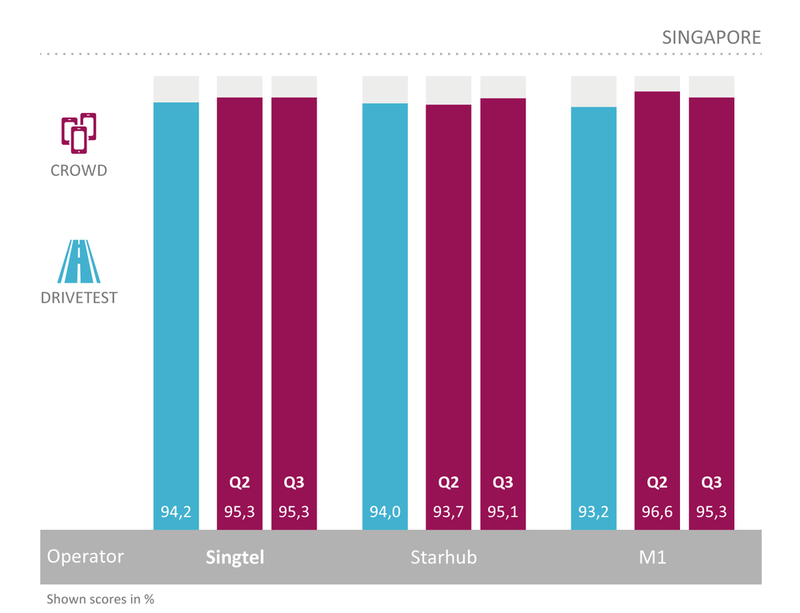 Singtel and StarHub improved regarding this KPI in the ­second period, only M1 fell a little behind. On the other hand, the average data rates dropped in all networks in the second observation period. In some of the KPIs, M1 showed a slight ­advantage. The examination of the Data Service Availability showed minor degradations in the StarHub network in March and in the M1 network in September. According to the Singapore Info-Communications Media Development Authority’s (IMDA) statistics, ­Singapore’s mobile market has a penetration rate of almost 150 per cent. A total of 5.6 million inhabitants hold about 8.5 million mobile subscriptions – comprising of roughly 60 per cent postpaid and 40 per cent prepaid subscriptions. ­(India, South Asia and ­Africa), ­Telkomsel (Indonesia), Globe Telecom (the Philippines) and Advanced Info Service (Thailand). With an operating revenue of 17.5 billion Singapore Dollars (about 12.5 billion US Dollars) in the fiscal year 2018, Singtel is one of the largest telecommu­ni­ca­tions companies in Asia. The group specifies over 650 million customers in 21 countries.In Singapore, Singtel has 4.1 ­million ­mobile subscribers, which equals a share in the mobile market of about 48 per cent. In the course of the liberalisation of the Singapore telecommunications market, StarHub was awarded the licence to provide fixed ­network and mobile services in 1998. The ­company was officially launched in April 2000 and has been ­listed on the ­Singapore stock exchange since 2004. StarHub currently counts about 2,500 employees. For its fiscal year 2017, the Group published a mobile revenue of 1.2 ­billion Singapore Dollars (about 0.9 billion US Dollars). When also taking Pay TV, broadband, fixed line and other revenues into ­account, the com­pany achieved a total revenue of 2.4 billion Singapore ­Dollars (about 1.7 billion US Dollars) in 2017. For Singapore, StarHub specifies 2.3 million mobile subscribers which equals a mobile market share of about 27 per cent. M1 Limited (­previously known as MobileOne) was formed in 1994, launched its mobile service in 1997 and became a ­publicly ­listed company at the end of 2002. M1 now employs over 1,500 people. The company prides itself to have launched South East Asia’s first commercial LTE network in June 2011 and to have become the first operator in South East Asia to offer nationwide 4G services from September 2012. For its fiscal year 2017, M1 published an operating revenue of 1.1 billion Singa­pore Dollars (about 0.8 ­billion US Dollars). ­Additionally, the company specified a fixed ­services revenue of 130 million Singa­pore Dollars (about 94 ­million US Dollars). At the end of 2017, M1 ­­had a total of 2.2 ­million mobile customers and 189,000 ­fibre subscribers. Its mobile customer base equals a market share of about 26 per cent. This year, P3 and connect have conducted a Mobile Review in ­S­ingapore for the first time. This review just marks the start – further, even more complex investigations of the network quality applying more KPIs are planned in the future. P3, headquartered in Aachen, Germany, is a world leader in mobile network ­testing. The company has over 3,500 employees world­wide and a ­turnover of ­more than 350 mil­lion Euros. 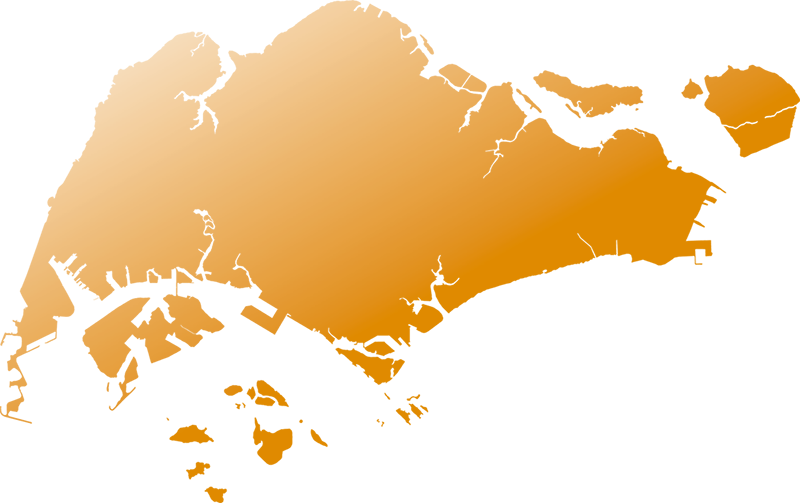 P3 is partnering with the international telecommunications magazine connect, which has more than 20 years of ­editorial expertise and is one of the leading test authorities in ­Europe for tele­communications products and services. ­Together, P3 and connect ­have been conducting the most impor­tant network ­benchmark test in ­Germany for more than 15 years, ­extending it to other ­European countries since 2009. ­Above that, P3 has been con­ducting its authoritative Mobile Benchmarking in ­Australia ­since 2014 ­where it is well known and respected. P3 and connect also exa­mined many other mobile networks all over the world including those the USA. In 2017 alone, P3 compiled more than 60,000 mea­surement hours in more than 80 countries across five continents, with its test vehicles covering ­almost one million kilometres. Recently, P3 has expanded its testing scope by amending the drivetests and walktests with a sophisticated and statisti­cally highly reliable crowdsourcing approach. As the de-facto industry standard, the P3 benchmarking methodology focuses on customer-perceived network quality. P3‘s network benchmarks are ­widely accepted as a completely objective authority. In 2018, P3 and connect have extended the scope of their network ­assessments to the city-state of Singapore. This market is ­particularly ­interesting with its very large market penetration of almost 150 per cent (see the previous page) as well as its very high standard of network ­quality which is also ensured by strict regu­latory requirements. This year, P3 and connect have started their qualified look into the Singa­pore ­mobile market by mainly concentrating on the data ­quality of the networks – ­taking into account the typical usage patterns of ­mobile ­subscribers as well as the importance of mobile data ­availability and performance for future applications such as IoT or automotive ­connectivity. To achieve this, P3 have conducted a data-centric drivetest in May 2018. In ­order to validate and supplement its results and analyse trends in the development of the networks‘ performance, we have also ­conducted an ­exten­sive crowdsourcing analysis covering two periods of three months each in order to be able to also. The results of both approaches ­clearly reflected the high performance level of the mobile networks in Singapore.